A wedding ceremony usually has a series of events that take place; that is precisely why an itinerary is used. 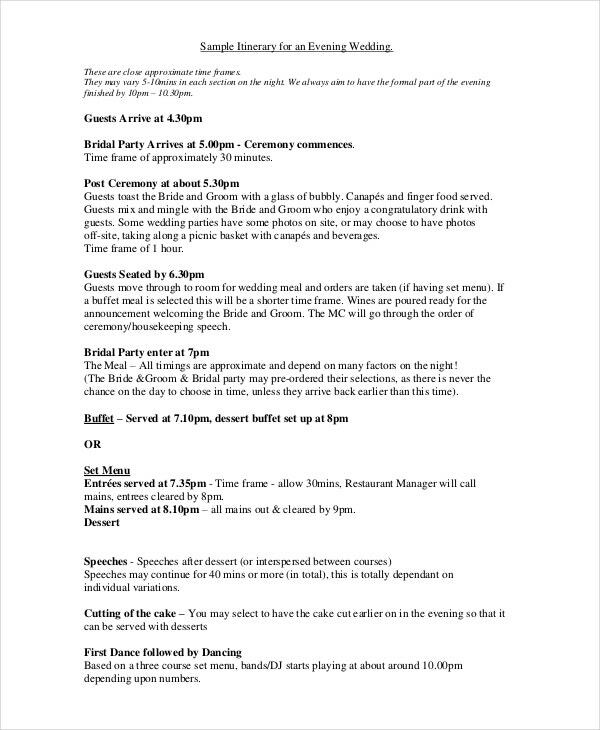 An itinerary template basically gives the attending guests an idea of all the events that are going to take place and the order in which they are supposed to take place. However, if you are planning to create a wedding itinerary for your wedding, you could take a look at these wedding itinerary templates here. This wedding reception itinerary template would be perfect if you want to plan the various events of your reception. Plus, it is elegant and sophisticated in terms of presentation and appearance. 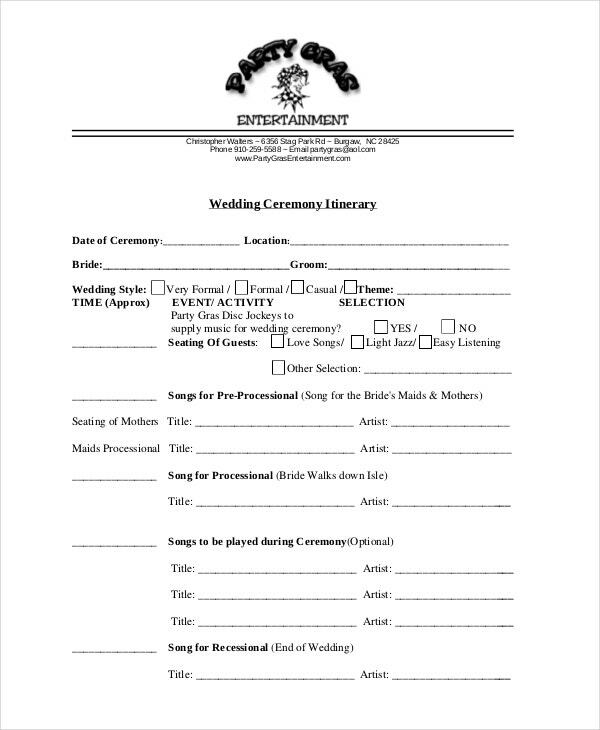 You can also see Wedding Program Templates. 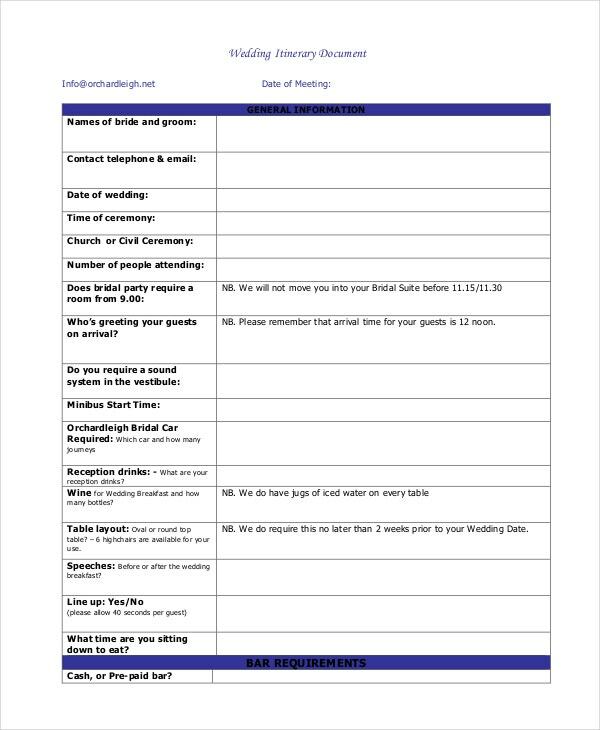 If you are having your wedding spanning over the course of a weekend, you could use this wedding itinerary template here. You could add as many images as you want and even tweak certain details to make it your own. 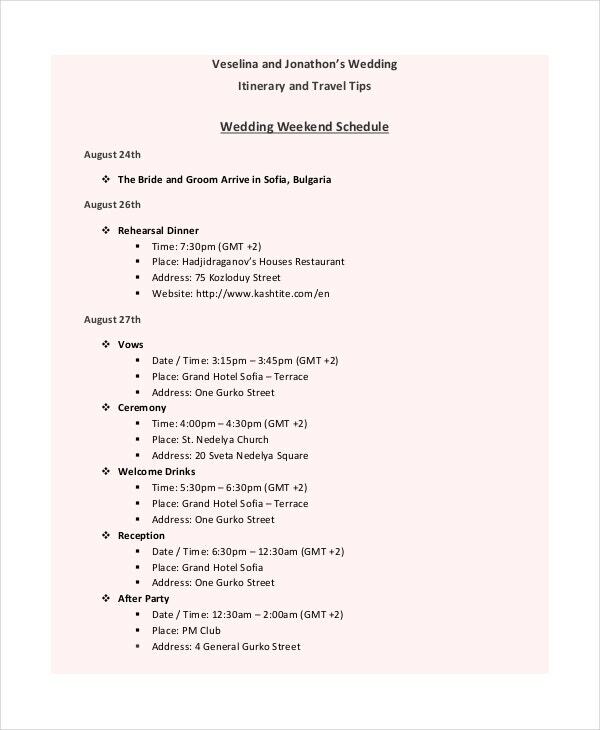 This wedding itinerary template is meant to be handed over to your guests. Your guests need to have an idea of what’s going to happen at your wedding and what you have in store for them. This itinerary template is extremely easy to use and comes with customization tools. You can also see Event Itinerary Templates. 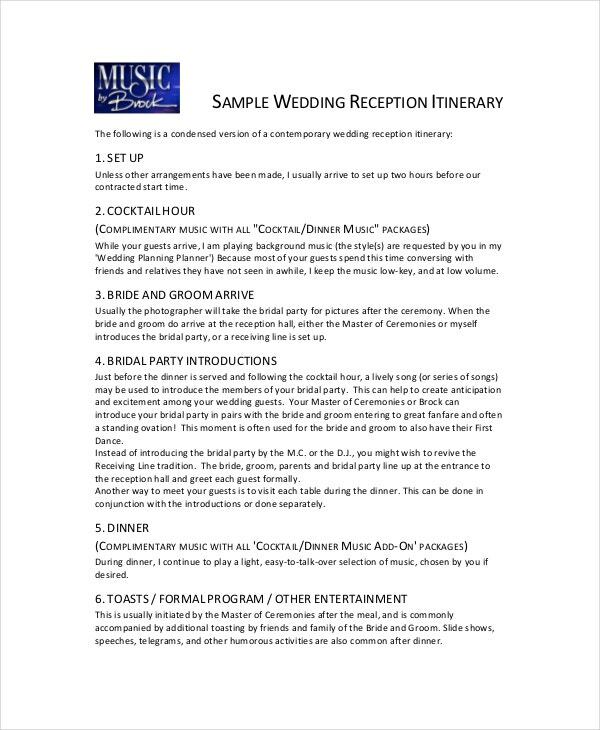 > Why should you use Wedding Itinerary Templates? Anyone who has ever planned a wedding would know that weddings can be tedious. There are so many things to be done, so many things to be taken care of. The wedding itinerary or the schedule of events to take place is just a minor aspect in the larger scheme of things. If you have already prepared the schedule of your wedding, you need to present it in a beautiful and elegant manner like the ones in the templates here. 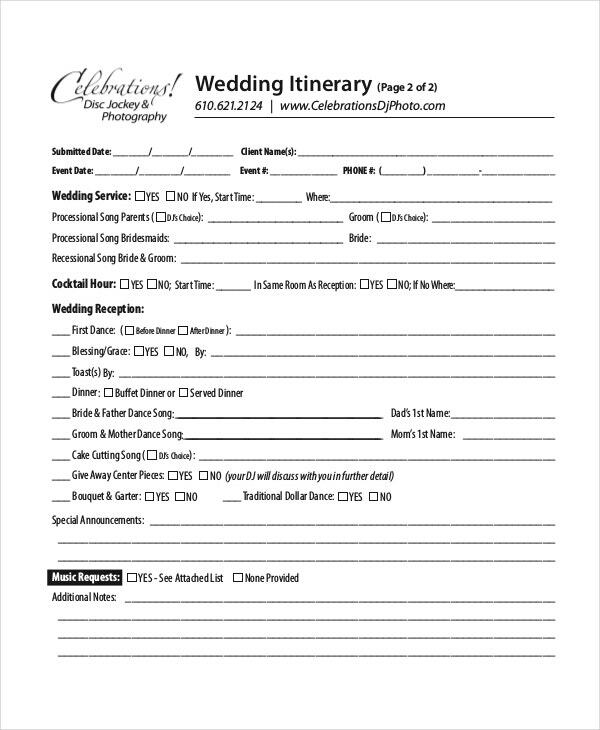 You can simply download the wedding itinerary templates and then organize the schedule accordingly. The wedding program templates would certainly make your work a whole lot easier. 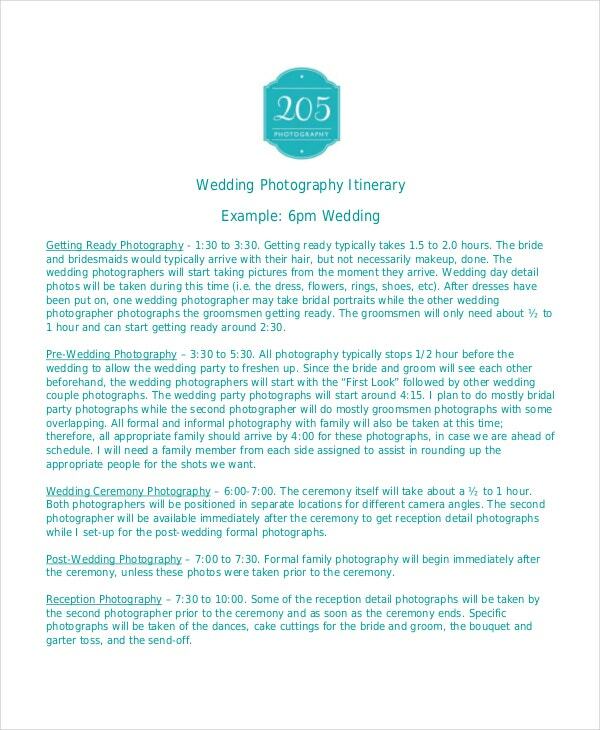 This template here is one of the supreme examples of a wedding ceremony itinerary template. The template comes with an attractive design which is sure to go with the theme of your wedding. Plus, the content and the format are absolutely spot on. When it comes to weddings, there is nothing better than sticking to the simple and the traditional way. That is exactly what you get with this template. It has been kept rather simple and devoid of any kind of excessive design. 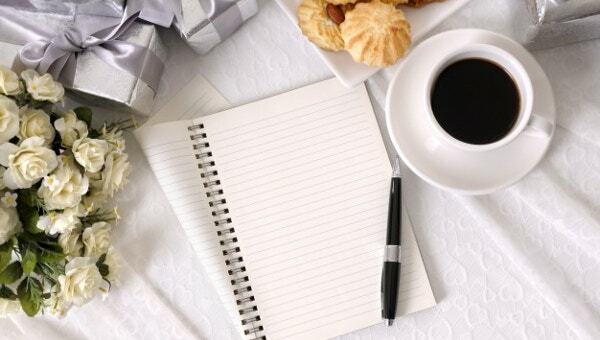 First and foremost, you need to come up with the schedule of your wedding. That is the first thing you need to take care of. You should have a clear idea of what you want your wedding to be like and how you want to plan it out. Secondly, you should prepare a rough draft. Before you incorporate the timeline into the final wedding timeline template, get a rough draft done. 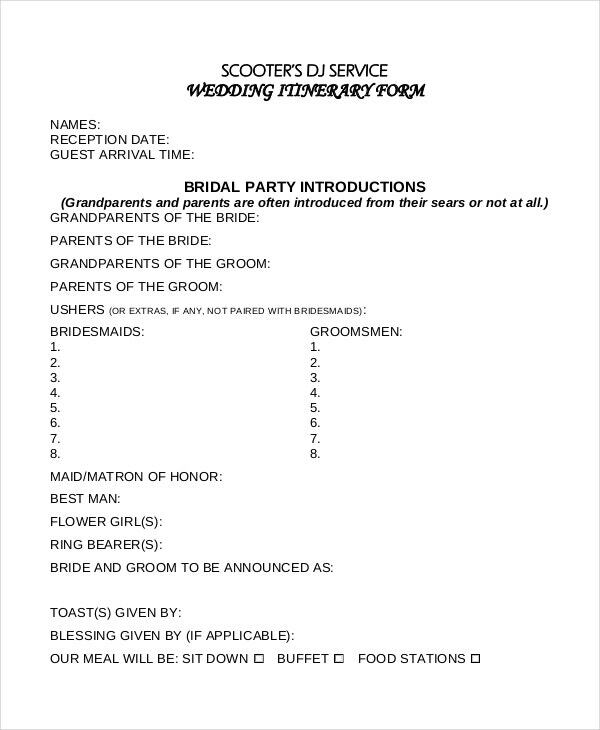 Make sure the wedding itinerary template you select goes with the overall theme of your wedding. These templates here are fantastic examples of event itinerary templates. These itinerary templates wouldn’t simply be a means of presenting a schedule; they would also help you chalk out a timeline which is of utmost importance for a wedding. Plus, you will not often come across templates that are as elegant as the ones here.